Is Finnish foreign policy on Russia in for a change? Yesterday I wrote a short blog on asylum seeker routes. The thing that piqued my interest was the statement by EASO director Robert Visser, who stated in Dutch newspaper Trouw, that “Since a few weeks, Finland gets remarkable amounts of asylum seekers [through Russia]”. In Finland, reports are focused on Tornio, which is situated between Sweden and Finland at the end of the Gulf of Bothnia. So far, I have heard little about border crossings at the Salla or Raja-Jooseppi stations. This article states that this year, so far, only 12 asylum seekers have crossed the border in Raja-Jooseppi (in Northern Lapland) although the authors are wondering whether the situation would develop like in Norway (Storskog). So this means that EASO has more information, or that they are simply wrong. But suppose the informed estimate is correct and asylum seekers are travelling through Russia to Finland (or Norway), what questions does that raise for Finnish foreign policy? (I leave aside the question of probably extremely harsh winter circumstances in Russia). Given that apparently the Finnish foreign ministry has a campaign in the near Middle East trying to discourage people from coming to Finland, I would think that the Finnish government would not be very happy if large groups of people start arriving in Northern Finland. The question then is: what kind of co-operation is there between Finland and Russia on information sharing regarding asylum seeker movements? Personally I think current Finnish policy regarding asylum seekers is counter-productive and not just, but that is not relevant for now. Since my guess is that asylum seeker flows will seek the route of least resistance, I suppose that if significant amounts of people start turning up at the border with Russia, Finland may have to adapt its policy regarding Russia, since given the policy of keeping asylum seekers out it would need co-operation on the Russian side. This would have quite big implications for the EU also. Finland’s economy was kind of sacrificed with the sanctions on Russia, and the conflict between the EU and Russia about Ukraine may have implications for this Syria asylum seeker issue as well. It is not written in stone that Russia will help in this (i.e. trying to stem the flow) unless it can get some kind of lessening of the sanctions. Although I obviously have no data to back this scenario up, I am sketching a possibility. It may or may not come true, or in another way, but increasingly the crises that the EU faces become interconnected. And as in the past, Finland is again between Russia and the West. I hope and trust that the Foreign Minister and his civil servants have the knowledge and skills to successfully navigate this crisis. Finland: what is its competitiveness? 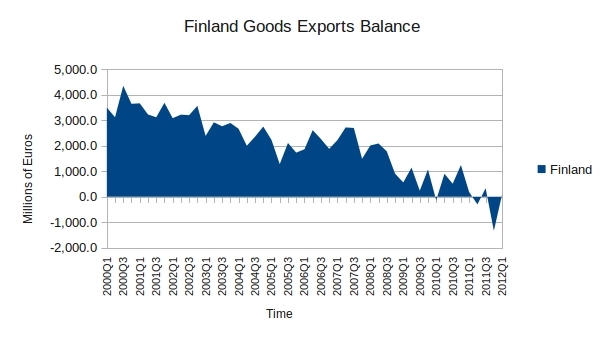 The Finnish economy is not doing well, regardless of the better-than-estimated growth. Politicians, business representatives and also labour unions talk about Finland having become uncompetitive, especially relative to Germany. This is commonly expressed through a comparision of the (Real) Unit Labour Cost developments. Especially the wage increases in the sectoral collective bargaining rounds of 2007-2008 are frequently blamed for Finland’s downfall. Recently, I have read all kinds of literature related to trade diversification, export performance and such. It was also nice to discover this website, which can provide a wealth of insight. 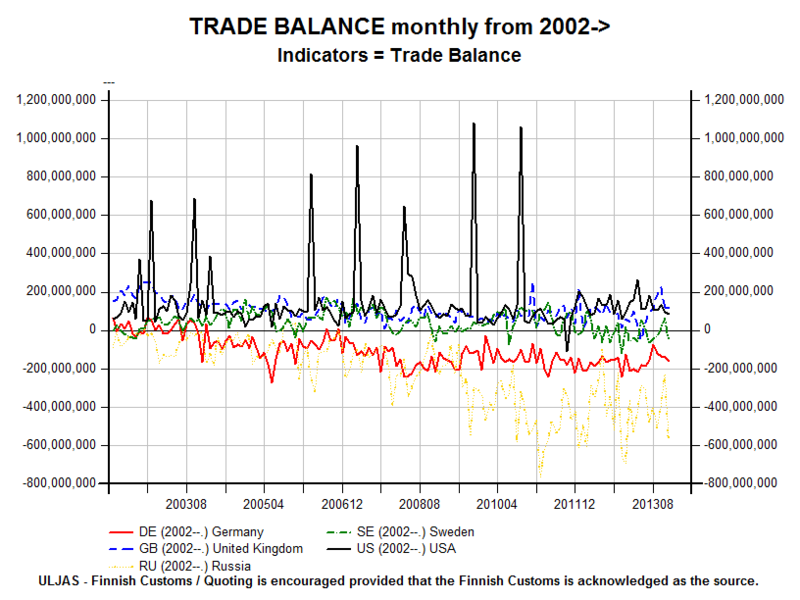 Basically my thought for this post is: If Finland is so uncompetitive, this must somehow show up in the data. Another issue is: Finland is frequently mentioned as very competitive and high-tech, such as in this article, but does this show up in Finland’s exports? 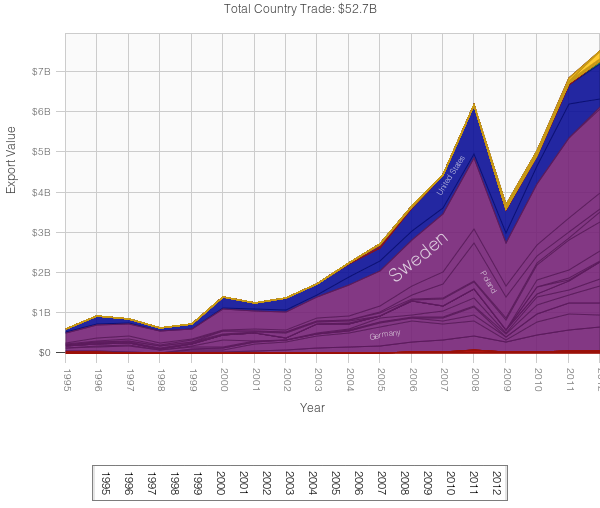 The top export destinations of Finnish exports are Sweden, Germany and Russia (followed by the Netherlands, UK, USA and China). That is the ‘macro’ picture. 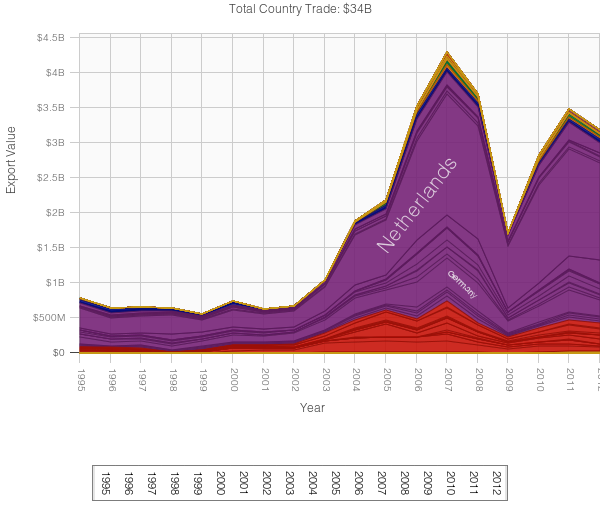 If you look at those individual countries, you will see completely different ‘export packages’. 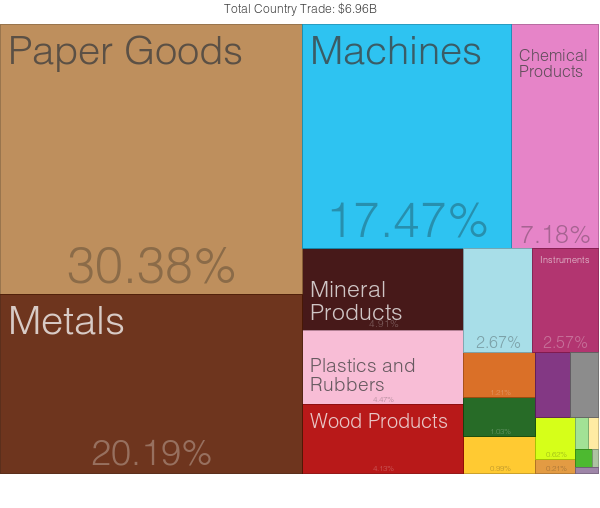 Half of what Finland exports to Germany is either paper goods or metal goods (this can be steel plates, zinc, nickel, iron pipes etc.). 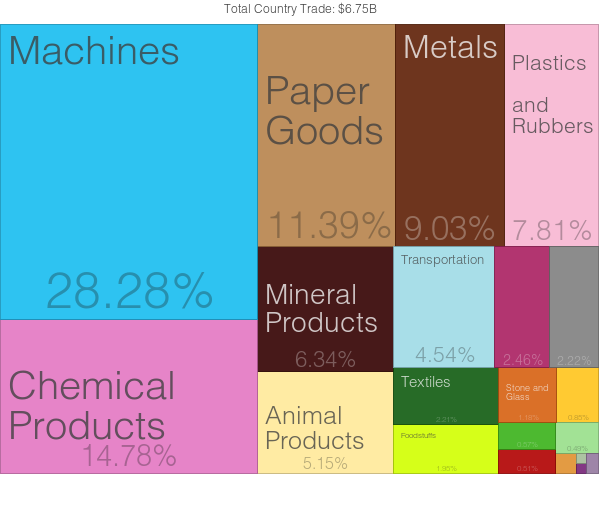 Machines account for nearly 18% of exports. 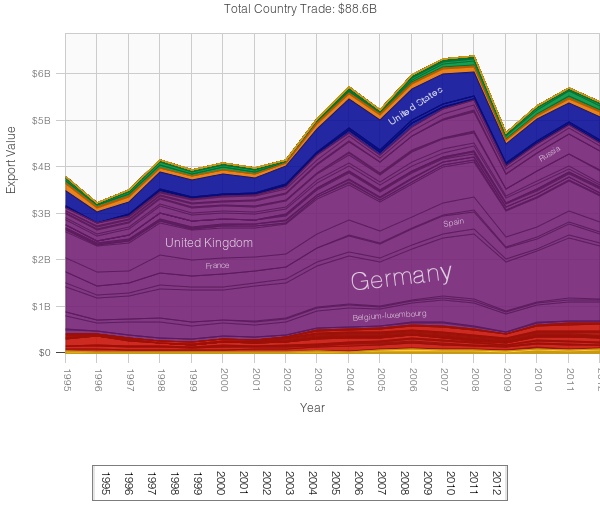 These are typically machines for the German industry to make things (e.g. paper machines, processing machines, lifting machines, …) but it also includes telephones, electrical transformers and electrical motors. Mineral products is the category code for e.g. oil-based products, like petroleum and refined petroleum. Chemical products also include medicaments. 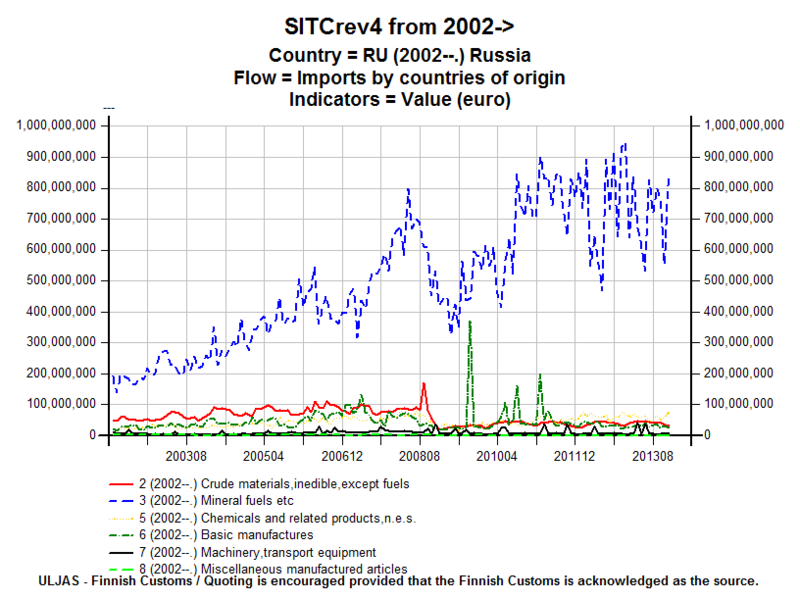 Again, chemical products, phones, computers and other machinery are a large part of exports, but Russia is also a significant market for Finnish dairy products. 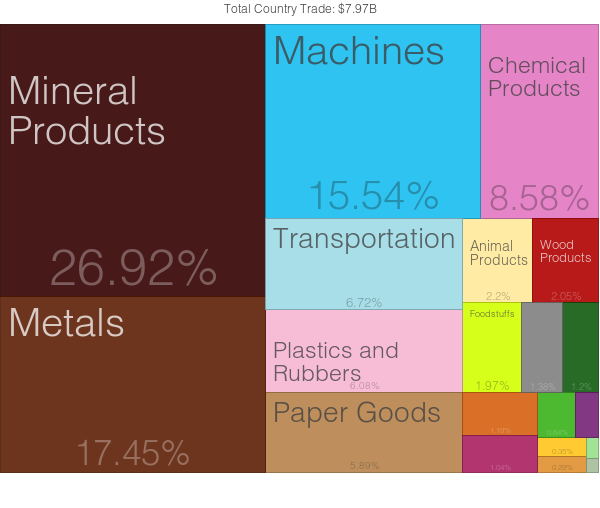 To make the picture complete, I provide a list of the Top-40 export products from Finland (in 2012), in terms of export value (in US$), see below. What I find striking, is that in terms of the classification used by Cafiso (2009) there are only a few high-tech export products in the top-40, and the top-6 features ‘traditional’ industry products, as in relatively low-tech. 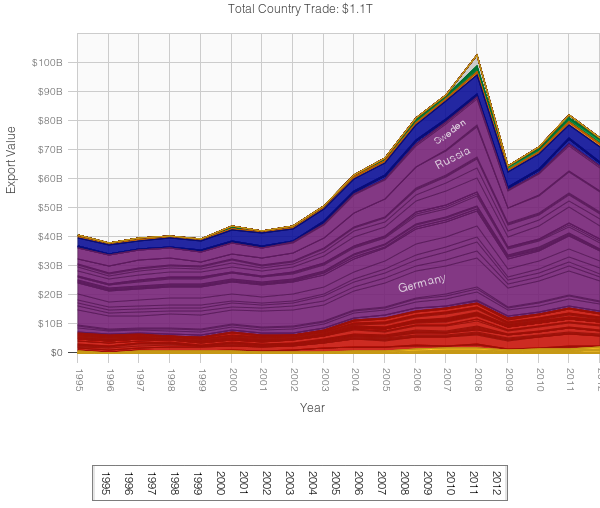 In terms of export value, the Finnish paper industry is far from being history. Strange to say maybe, but depending on the destination and the product Finnish competitiveness does not look too bad. Yes, the start of the Great Financial Crisis is visible in the data in 2008-2009 and from 2011 European demand for two of the three products here is in decline. But that doesn’t mean that Finland is uncompetitive – German exports of stainless steel and kaolin coated paper also declines, especially in Europe. I think one of the most relevant lessons of these sketches is that in Finland the industries that produce the top-40 products are typically very capital-intensive. 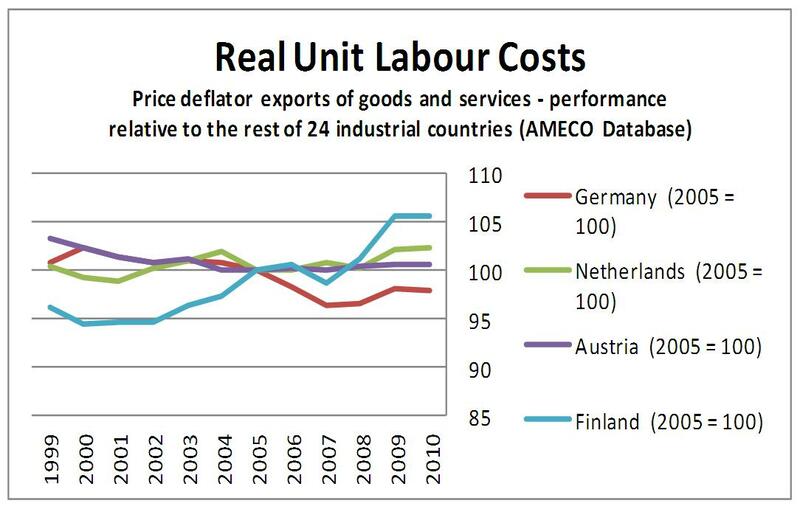 It may be true that Finnish Real Unit Labour Costs are higher than in Germany, but does it matter? Storm and Naastepad (2015) conclude that for Germany (and other industrialized countries) trade is not very sensitive to changes in Real Unit Labour Costs. This overview of some of the aspects of the Finnish export industries has implications for the labour market relations and what issues are emphasised (either by labour unions, the state or employers). I hope to write more about that in a later phase.